As we rose in Magrath at about 7am, we had a herd of White Tail Deer grazing and playing outside our camp. Sunny and 11C, time to hit the road. Strong coffee in hand and off we went. 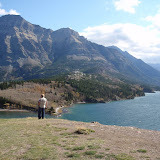 Our target for the day was Waterton, in Waterton Lakes National Park also referred to as Waterton - Glacier International Peace Park or Waterton Biosphere Reserve (more on this in our next blog). A short drive for the day, around 100Km. Almost down to the USA border. We drove through some very beautiful country, lots of wind farms, ranch land, and some farm land. Once we got closer to the park, one thing was very clear, this is where the Prairie hits the Rocky Mountains, forget the foot hills, they somehow got left out. You drive along and all of a sudden there is this wall of rock called the Rocky Mountains. We cruised into the town of Waterton, well we actually stopped for several picture shoots on the way in, this is so spectacular. We also stopped at the Waterton information office (don't think they had a good day, I'm sure they would have charged for a smile) and got the low down about the park. This park is so beautiful, and in our opinion is much nicer then Lake Louise or Jasper. Maps in hand we headed down to the campground right on Waterton Lake in the town site. The GPS Coordinates are, Latitude: 49.048746, Longitude: -113.909336 , or the street address is 200 Vimy Ave. This lake can be pretty windy, so you may want to check the forecast before choosing the campsite. The average daily wind speed is around 30km/hr and gusts of over 100km/hr are not uncommon and gusts of 150km/hr have been recorded in the valley.... Wind surfing anyone??? If you are parked close to the waterfront the wind could rock you all night (Liz thought we should throw a couple of anchors out) There are 237 sites in the Townsite campsite. We had a quick lunch and headed out to discover the park. First we headed back up to the Prince of Wales Hotel, which was closed for the season. The Prince of Wales Hotel was constructed between 1926–1927, by the American Great Northern Railway. This was to attract American tourists during the prohibition-era 1920-1933. The hotel was named after the Prince of Wales who later became King Edward VIII. They named it so to bribe him to stay in the hotel on his 1927 Canadian tour. Unfortunately The Prince of Wales stayed at a nearby ranch instead, that figures.... Lessons learned, bribery does not work on royalty. The hotel was designated a National Historic Site of Canada by the Canadian government in 1995. It is also one of the most photographed hotels in the world. The Prince of Wales Hotel is different looking than most hotels, having soaring roofs, gables, balconies and true craftsmanship. Make a reservation at the National Park Reservations. Next on the list was Cameron Lake, 16 km from the town-site of Waterton. The road is called Akamina Parkway. On the way to Cameron Lake we stopped and had a look at Western Canada's first oil well located in the park. The story has it that in 1889, oil seeps known to the native people in Southern Alberta attracted the attention of many pioneers. Newspaper reports fuelled a flurry of petroleum claims in the Waterton area and within five years, the few attempts to sink wells had ended in failure. Almost a decade after the initial exploration, William Aldridge found a use for the the oil he had gathered from local seeps. Skimming it from sluice boxes and selling it locally as lubricant and medicine, he was the first to utilize the seeps commercially. In 1897, a pioneer called John Lineham established a mineral claim beside Oil Creek. He formed the Rocky Mountain Development Company and set off to find and drill for oil. The company hauled heavy equipment on a narrow horse trail over the prairie and through the mountains. Workers erected what is referred to as a "Canadian Pole" rig, made entirely of wood. This contraption was powered by a 35 horse-power steam engine. No speed records were set in those days, drilling progressed very slowly, mainly due to equipment problems, inexperience and accidents. In 1902, the Lineham Discovery Well No. 1 struck oil at 311 m (1,020 ft), and the story has it that the well produced 300 barrels a day. Cameron Lake is nestled between the majestic mountain peaks of the Akamina Ridge, and is a sub-alpine lake which is one of many serene bodies of water that makes up Waterton Lakes National Park. Why it rains and snows at Cameron Lake.... 152cm or 60 inches per year of precipitation. Cameron lake is a spectacular place, a great place to rent a canoe and go for a paddle or hike one of the many trails.... Make sure to have the bear bells and pepper spray along, grizzlies are often seen on the far slopes of the lake. The lake receives an average of 152cm or 60 inches or precipitation per year. Looks like we will have a rain shower, it is time to head back to town and plan for the Buffalo Paddock and the Red Rock Canyon.... more to follow in the next blog. Lots of pictures in our Picasa Album "From Magrath, AB to Waterton National Park" or click on the picture below. Make sure to click on "Slide show" in the top left area to view the album as a slide show. Hi there - you two are sure having fun in your 5th wheel! We enjoy our motorhome a lot too. We are getting ready to head south soon - mid December. I love your photos - your video is great - such techno geniuses!